At Do LaB we believe in the importance of experimentation and pushing the envelope of what a festival can be. Woogie Weekend was created in this spirit and we learned a lot while also having an amazing time and experiencing some incredible sets of music. As we announce today that Woogie Weekend is going on hiatus, we are forever grateful to everyone that helped us create it, and everyone that came and brought it to life. So while Woogie Weekend may be going on the shelf for the time being, we are taking what we learned and applying it to a future project that will take those Woogie vibes to an even higher level. The focused music lineup, intimate vibes, and cohesive mix of art, yoga, and great dance music helped make Woogie Weekend an unforgettable experience (not to mention year 1’s crazy rainstorm), and we love the fun-loving community that coalesced around it. These highlights and much more will appear again in an exciting new project that is in the planning stages for 2018. We are excited to share more details on this groundbreaking project we have in the works, but we ask for your patience as we devote this summer to focusing on the project and creating an entirely new festival experience from the ground up. In the meantime, The Woogie lives on at Lightning in a Bottle! With a new stage planned and a fantastic lineup, this is definitely a year where the Woogie at LIB is not to be missed. We are forever grateful to everyone that made Woogie Weekend so beautiful and fun and we can’t wait to see you at the Woogie at LIB! WIN TICKETS TO WOOGIE AT LIB THIS YEAR! 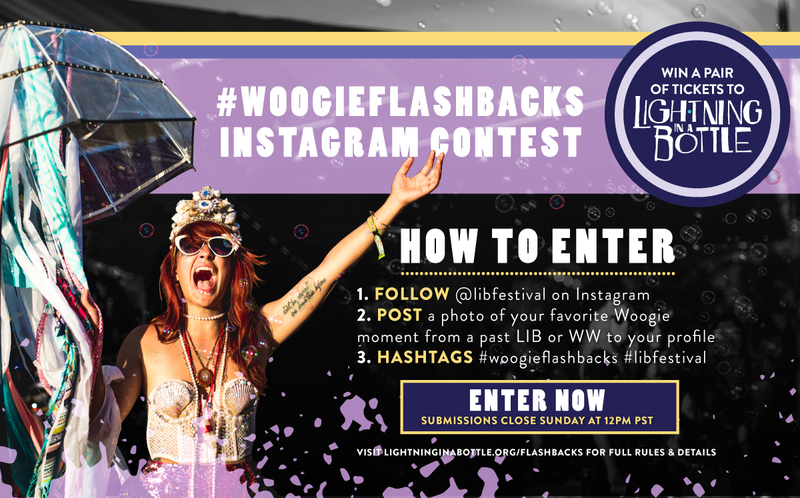 Share your favorite Woogie memories with us on Instagram using the hashtag #WoogieFlashbacks for a chance to win a LIB 2017 4 Day Festival Pass! Please read the rules and guidelines before entering! Submissions that do not follow all of the rules will be disqualified. LAST CHANCE TO BUY WOOGIE WEEKEND MERCH! You have until tomorrow Feb. 23rd 10am PST to purchase Woogie Weekend merch with prices up to 50% OFF! These merch items will not be sold again after tomorrow so if you want to keep your wardrobe Woogie’in, hop on this once only sale NOW!